Do you enjoy helping others, supporting your fellow residents and being part of the residential community? Make a real difference and take on a leadership and support role with the Residential Support Team. The Residential Support Team (RST) provides support, engagement and development opportunities to the whole residential community. Being part of the RST provides you with the opportunity to make a difference in the residential community, host a range of events and activities throughout the year, support your fellow residents, develop lifelong skills, access a range of training opportunities as well as make some amazing friends and memories. Not to mention it's an invaluable addition to your CV. FedUni Living RST Scholarships are available for volunteer RST members. A number of volunteer positions will be available each year, appealing to a wide range of interests and skills. You will have the opportunity to be involved in a range of programs including social, events, sports, leadership, academic, engagement, initiatives, communications, media, promotions, environment, welfare, diversity and more. Find out more about the Residential Support Team Scholarships. "Becoming a Residential Advisor has been a life changing experience for me." "The opportunity has helped me grow both professionally and personally. I love the interactions I get to have with the staff and residents. I now feel more confident in my abilities as a leader and I can see how the position has and will continue to have a positive impact on future opportunities presented to me. The role can be challenging but the outcomes are invaluable. I can proudly say that I was able to contribute to this res community and I will remember my experiences here fondly." It looks great on your CV! so much more ..... talk to your current RA to find out what they have loved most about the role! RST volunteers will receive extensive training, teaching invaluable skills that are vital in the day-to-day role of being a RST member, as well as come in handy throughout your life, and look fantastic on your CV. The training and workshops will prepare you for the wide range of situations and experiences that you may encounter. You will be expected to complete all components of our highly regarded and award winning RST training program. 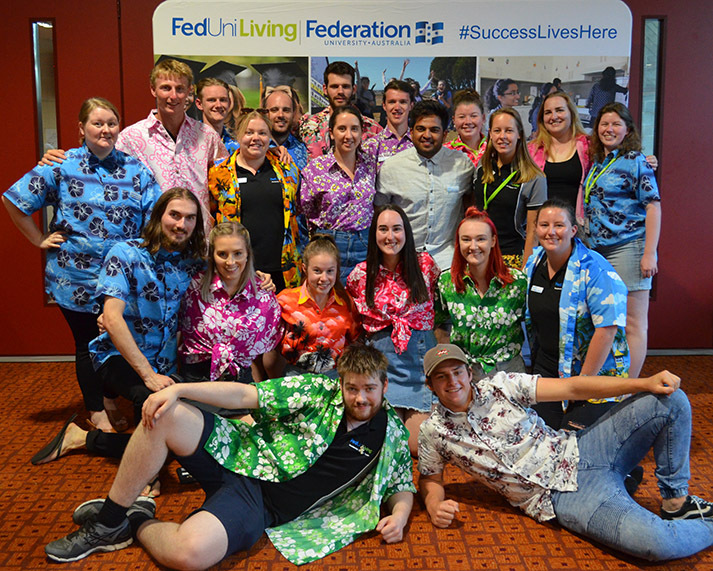 As a volunteer community leader and ambassador for FedUni Living, you will be expected to support your community and set a great example, working with the Residential Support Team (RST) to promote the FedUni Living values, mission and goals. Find out more about the expectations of the members of the Residential Support Team. "What I've loved most about being in the RST this year are the connections I've made. " "It's been a thoroughly enjoyable experience meeting new residents from close to home and abroad as well as strengthening already close bonds with other members of the RST. There have been many challenges faced where we've all had to deal with situations or go out of our comfort zone in performing new roles or organising events. The training and a supportive and positive team atmosphere has made this a fun team to be a part of. I would recommend this opportunity to anyone looking to give back to the Res Community and be a part of a fun, challenging and rewarding role. Just remember, we were all nervous 1st Years at some point." Visit the FedUni Living office, speak to a current member of the Residential Support Team and find out more about the RST expectations and Scholarships.